Last month in one of my blogs, “How to Successfully Leverage IoT; It’s Not Technology,” I discussed the value of a strong network of integrator partners, such as the EcoXpert network. I also discussed the role people play in executing technology solutions for buildings where IoT and the convergence of Operational Technology (OT) and Information Technology (IT) deliver new opportunities for optimization of automation and power distribution. More recently, I had an opportunity to talk about this with the owner of a system integration company in China, and collect his view on trends related to optimization of automation and energy systems. He accepted that a partner network, like Schneider Electric’s EcoXpert™ program, provide him with value by offering protection on his investment in skill development for his team of engineers. He also made the argument that the real opportunity being delivered through IoT and the convergence of IT and OT is his company’s ability to market themselves as a single provider of technology solutions that touch every aspect of a building’s infrastructure: electrical, mechanical, fire and associated monitoring and power control systems. Illustrating his point, he talked about a project being developed by his team for a very large healthcare center. An aging population, economic growth and expansion of health insurance has driven massive expansion in healthcare demand in China, and resulted in annual growth in healthcare spending of over 17% for the last 9 years. This growth has created a proliferation of private investment in hospitals and their supporting infrastructure: universities, clinics, da ta centers, power and logistic stations, medical imaging centers, etc. 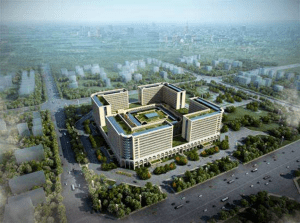 The healthcare center referenced by this particular EcoXpert partner will include 1,400,000m2 of building area on both a physical and digital campus that stretches across the Shaanxi Province. The digitization of the campus is driven very much by IoT, and the need for centralized facility and data management. His company’s ability to successfully integrate the building management system (BMS), a mission-critical electrical power management system (EPMS), and a data center infrastructure management (DCiM), provides him not only with a differentiated competitive advantage, but with greater control over the subcontracting process to help influence the technology that will enable his success. Despite the strength of local manufacturers in China, Schneider Electric maintains a strong advantage in projects like this healthcare center. System architectures supported by Schneider Electric’s EcoStruxure™ technology are provided by a foundation layer of intelligent products ideally suited to complex facilities like a healthcare center, along with interoperable software and cloud-connected digital services. An EcoXpert that becomes certified across disciplines, develops a competitive edge while gaining access to a variety of technology from Schneider Electric that works within the EcoStruxure Platform to integrate seamlessly. The result? Optimized automation and energy distribution. In speaking about his philosophy on how his company drives success with customers like this healthcare center, he claims “product stability [quality] and strong relationships” ultimately help him close deals. He extrapolated, his successful partnership with Schneider Electric survives based on technology that enables him to deliver complete solutions via innovation at every level, and on a shared commitment to competency and business development he receives in the EcoXpert program. Have you seen trends that support this kind of multi-disciplinary approach to deploying systems in buildings?